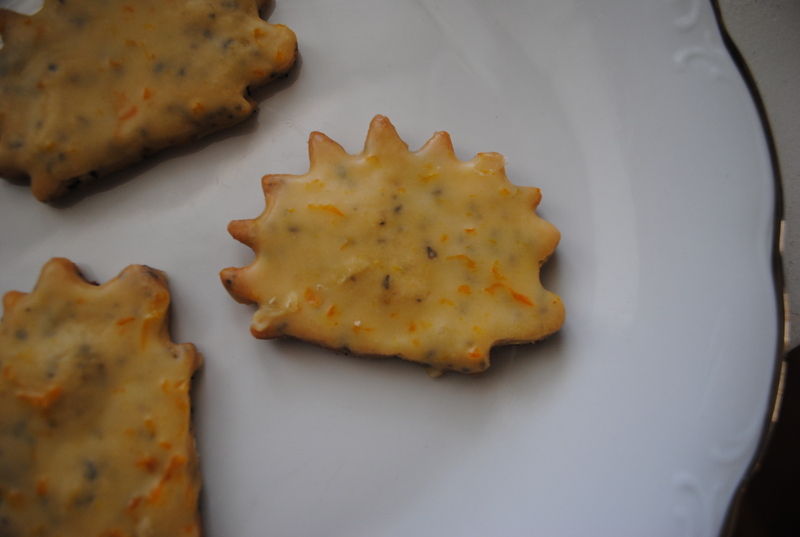 Earl Grey Shortbread Hedgehog Cookies with Pixie Tangerine Zest & Citrus Glaze. Earl Grey is my favorite tea; a distinct black tea with bergamot and citrus. Okay, I am going to make myself a cup after I finish writing this post. I saw this recipe for Earl Grey Shortbread cookies over on Clockwork Lemon. It looked easily veganizable and I had to use the last of my amazing Ojai citrus. It also turned out that there was a Worldwide Vegan Bakesale event going on right down the street from my house. This bakesale was raising money for the awesome organization Compassion Over Killing. I decided to make up a batch of the above cookies and donate most of them to the bakesale. I am happy to say they were buttery and delightful. I hope everyone else who got to try them feels the same. Preheat oven to 375°F. Line two baking sheets with silpats. Combine flour, tea and salt. Next, in the bowl of your stand mixer, cream together Earth Balance, sugar, and zest until fluffy. With the mixer on low, add the flour mixture. Gather dough into a ball and chill in the fridge until cool enough to roll out. Roll dough out to about ¼” thick and cut into desired shapes. I don’t know, I was feeling hedgehogs! Bake 10-13 min until edges of cookies just start to turn golden. For the glaze, I juiced my remaining citrus. It was a combo of navel oranges, pixies, gold nugget tangerines, and a Minneola tangelo. The juice was so good! Anyhow, take 1-2 tbsp of orange, tangerine etc juice and the zest of a pixie or orange or whatever. Add confectioner’s sugar until a glaze of your desired thickness and consistency comes together. ← Risotto w/ Leeks and Sun-Dried Tomatoes.